Biggest & Best on the Semiahmoo Peninsula Thousands of bargains from vendors all over the Lower Mainland Discover that special or unique gift that simply isn't available in retail stores. 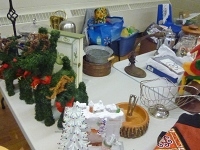 Many of our vendors have hobby collections looking for a new home. Others create rare handcrafted artworks. You won't be dissappointed! Have Fun SAVE Money We promise you will be greeted with a SMILE! Home of the $2 Hotdog Door prize draws. Free Parking & Admission only $1 Plenty of free parking in the lot right behind our home; the Star of the Sea Community Centre in White Rock. All proceeds go to Community Charitable Causes! 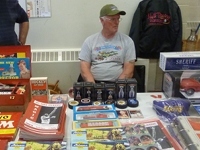 Toys,Hobbies,Knick Knacks Model railroads, Disney Promotions, Star Wars Collectables. There's a good chance you'll find something you'll want to have. 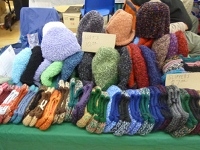 Art, Knitted Goods, Unique Homemade Products Everything from delicately painted stones, to hand knitted wear. Lots of things you won't find anywhere else. Rare Items, Jewelry, Etc. We can't gaurantee that you'll discover a hidden treasure, but we know you'll have fun trying.